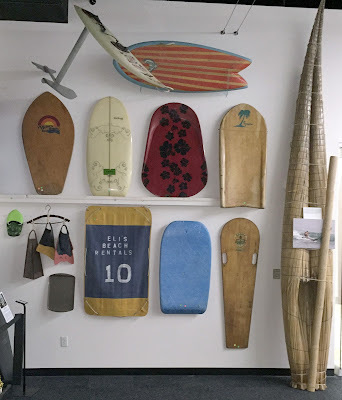 One of Laird Hamilton's hydrofoil boards, a Dyno kneeboard, a '70s Victoria Skimboard, a '60s "Paipo" bellyboard, a Hawaiian plywood, fiberglass and resin paipo, a balsa twinfin bellyboard, an Enjoy handplane, some swim fins (including 1 of Mark Cunningham's), a McDonald's tray, a canvas mat (good for rashes from neck to knees), an early Boogie Board, a Hawaiian bellyboard (popular with visiting tourists in the '30s, '40s & '50s), and a Peruvian Caballito de Totora. Great display! Many thanks for sharing part of the display space to showcase these other surf riding craft. Mahalo!